In ancient Roman religion and mythology, Janus is the god of beginnings and transitions, thence also of gates, doors, doorways, endings and time. He is usually a two-faced god since he looks to the future and the past. The Romans dedicated the month of January to Janus. His most apparent remnant in modern culture is his namesake, the month of January. Though he was usually depicted with two faces looking in opposite directions (Janus Geminus (twin Janus) or Bifrons), in some places he was Janus Quadrifrons (the four-faced). The Romans associated Janus with the Etruscan deity Ani. Janus was frequently used to symbolize change and transitions such as the progression of past to future, of one condition to another, of one vision to another, and of one universe to another. Hence, Janus was worshipped at the beginnings of the harvest and planting times, as well as marriages, births and other beginnings. He was representative of the middle ground between barbarity and civilization, rural country and urban cities, and youth and adulthood. While the fundamental nature of Janus is debated, in most modern scholars' view the set of the god's functions may be seen as being organized around a simple principle: that of presiding over all beginnings and transitions, whether abstract or concrete, sacred or profane. Interpretations concerning the god's fundamental nature either limit it to this general function or emphasize a concrete or particular aspect of it (identifying him with light the sun, the moon, time, movement, the year, doorways, bridges etc.) or see in the god a sort of cosmological principle, i. e. interpret him as a uranic deity. Almost all these modern interpretations were originally formulated by the ancients. The function of 'god of beginnings' has been clearly expressed in numerous ancient sources, among them most notably perhaps Cicero, Ovid and Varro. As a god of motion he looks after passages, causes actions to start and presides over all beginnings, and since movement and change are bivalent, he has a double nature, symbolized in his two headed image. He has under his tutelage the stepping in and out of the door of homes, the ianua, which took its name from him, and not viceversa. Similarly his tutelage extends to the covered passages named iani and foremost to the gates of the city, including the cultic gate called the Argiletum, named Ianus Geminus or Porta Ianualis from which he protects Rome against the Sabines. He is also present at the Sororium Tigillum, where he guards the terminus of the ways into Rome from Latium. He has an altar, later a temple near the Porta Carmentalis, where the road leading to Veii ended, as well as being present on the Janiculum, a gateway from Rome out to Etruria. The connexion of the notions of beginning (principium), movement, transition (eundo), and thence time has been clearly expressed by Cicero. In general, Janus is at the origin of time as the guardian of the gates of Heaven: Jupiter himself moves forth and back because of Janus's working. In one of his temples, probably that of Forum Holitorium, the hands of his statue were positioned to signify the number 355 (the number of days in a year), later 365, symbolically expressing his mastership over time. He presides over the concrete and abstract beginnings of the world, such as religion and the gods themselves, he too holds the access to Heaven and other gods: this is the reason why men must invoke him first, regardless of the god they want to pray or placate. He is the initiator of human life, of new historical ages, and financial enterprises: according to myth he was the first to mint coins and the as, first coin of the libral series, bears his effigy on one face. Janus frequently symbolized change and transitions such as the progress of future to past, from one condition to another, from one vision to another, and young people's growth to adulthood. He was represented time, because he could see into the past with one face and into the future with the other. Hence, Janus was worshipped at the beginnings of the harvest and planting times, as well as at marriages, deaths and other beginnings. He represented the middle ground between barbarism and civilization, rural and urban, youth and adulthood. Having jurisdiction over beginnings Janus had an intrinsic association with omens and auspices. Leonhard Schmitz suggests that he was likely the most important god in the Roman archaic pantheon. He was often invoked together with Iuppiter (Jupiter). According to Macrobius citing Nigidius Figulus and Cicero, Janus and Jana (Diana) are a pair of divinities, worshipped as Apollo or the sun and moon, whence Janus received sacrifices before all the others, because through him is apparent the way of access to the desired deity. A similar solar interpretation has been offered by A. Audin who interprets the god as the issue of a long process of development, starting with the Sumeric cultures, from the two solar pillars located on the eastern side of temples, each of them marking the direction of the rising sun at the dates of the two solstices: the southeastern corresponding to the Winter and the northeastern to the Summer solstice. These two pillars would be at the origin of the theology of the divine twins, one of whom is mortal (related to the NE pillar, as confining with the region where the sun does not shine) and the other is immortal (related to the SE pillar and the region where the sun always shines). Later these iconographic models evolved in the Middle East and Egypt into a single column representing two torsos and finally a single body with two heads looking at opposite directions. Numa built the Ianus geminus (also Janus Bifrons, Janus Quirinus or Portae Belli), a passage ritually opened at times of war, and shut again when Roman arms rested. It formed a walled enclosure with gates at each end, situated between the old Roman Forum and that of Julius Caesar, which had been consecrated by Numa Pompilius himself. About the exact location and aspect of the temple there has been much debate among scholars. In wartime the gates of the Janus were opened, and in its interior sacrifices and vaticinia were held, to forecast the outcome of military deeds. The doors were closed only during peacetime, an extremely rare event. The function of the Ianus Geminus was supposed to be a sort of good omen: in time of peace it was said to close the wars within or to keep peace inside; in times of war it was said to be open to allow the return of the people on duty. A temple of Janus is said to have been consecrated by the consul Gaius Duilius in 260 BCE after the Battle of Mylae in the Forum Holitorium. It contained a statue of the god with the right hand showing the number 300 and the left the number 65, i. e. the length in days of the solar year, and twelve altars, one for each month. The four-sided structure known as the Arch of Janus in the Forum Transitorium dates from the 1st century CE: according to common opinion it was built by the Emperor Domitian. However American scholars L. Ross Taylor and L. Adams Holland on the grounds of a passage of Statius maintain that it was an earlier structure (tradition has it the Ianus Quadrifrons was brought to Rome from Falerii) and that Domitian only surrounded it with his new forum. In fact the building of the Forum Transitorium was completed and inaugurated by Nerva in 96 CE. The rites concerning Janus were numerous. Owing to the versatile and far reaching character of the basic function of the god, marking beginnings and transitions, his presence was ubiquitous and fragmented. Apart from the rites solemnizing the beginning of the new year and of every month, there were the special times of year which marked the beginning and the closing of the military season, in March and October respectively. These included the rite of the arma movere on March 1 and that of the arma condere at the end of the month performed by the Salii, and the Tigillum Sororium on October 1. Janus Quirinus was closely associated with the anniversaries of the dedications of the temples of Mars on June 1 (a date that corresponded with the festival of Carna, a deity associated with Janus: see below) and of that of Quirinus on June 29 (which was the last day of the month in the pre-Julian calendar). These important rites are discussed in detail below. Any rite or religious act whatever first required the invocation of Janus, with a corresponding invocation to Vesta at the end (Janus primus and Vesta extrema). Instances are to be found in the Carmen Saliare, the formula of the devotio, the lutration of the fields and the sacrifice of the porca praecidanea, the Acta of the Arval Brethren. Although Janus had no flamen, he was closely associated with the rex sacrorum who performed his sacrifices and took part in most of his rites: the rex was the first in the ordo sacerdotum hierarchy of priests.The flamen of Portunus performed the ritual greasing of the spear of the god Quirinus on August 17, day of the Portunalia, on the same date that the temple of Janus in the Forum Holitorium had been consecrated (by consul Caius Duilius in 260 BC). Portunus seems to be a god closely related to Janus, if with a specifically restricted area of competence, in that he presides over doorways and harbours and shares with Janus his two symbols, the key and the stick. The Winter solstice was thought to occur on December 25. January 1 was new year day: the day was consecrated to Janus since it was the first of the new year and of the month (kalends) of Janus: the feria had an augural character as Romans believed the beginning of anything was an omen for the whole. Thus on that day it was customary to exchange cheerful words of good wishes. For the same reason everybody devoted a short time to his usual business, exchanged dates, figs and honey as a token of well wishing and made gifts of coins called strenae. Cakes made of spelt (far) and salt were offered to the god and burnt on the altar. Ovid states that in most ancient times there were no animal sacrifices and gods were propitiated with offerings of spelt and pure salt. This libum was named ianual and it was probably correspondent to the summanal offered the day before the Summer solstice to god Summanus, which however was sweet being made with flour, honey and milk. Shortly afterwards, on January 9, on the feria of the Agonium of January the rex sacrorum offered the sacrifice of a ram to Janus. Janus was also involved in spatial transitions, presiding over home doors, city gates and boundaries. Numerous toponyms of places located at the boundary between the territory of two communities, especially Etrurians and Latins or Umbrians, are named after the god. The most notable instance is the Ianiculum which marked the access to Etruria from Rome. Since borders often coincided with rivers and the border of Rome (and other Italics) with Etruria was the Tiber, it has been argued that its crossing had a religious connotation; it would have involved a set of rigorous apotropaic practices and a devotional attitude. Janus would have originally regulated particularly the crossing of this sacred river through the pons sublicius. Janus was the protector of doors, gates and roadways in general, as is shown by his two symbols, the key and the staff. The key too was a sign that the traveller had come to a harbor or ford in peace in order to exchange his goods. The rite of the bride's oiling the posts of the door of her new home with wolf fat at her arrival, though not mentioning Janus explicitly, is a rite of passage related to the ianua. In discussing myths about Janus one should be careful in distinguishing those who are ancient and originally Latin and others which were later attributed to him by Greek mythographers. In the Fasti Ovid relates only the myths that associate Janus to Saturn, whom he welcomed as a guest and with whom eventually shared his kingdom in reward of his teaching the art of agriculture, and to the nymph Crane Grane or Carna, whom Janus raped and made the goddess of hinges as Cardea, while in the Metamorphoses he records his fathering with Venilia the nymph Canens, loved by Picus. The myth of Crane has been studied by M. Renard and G. Dumezil. The first scholar sees in it a sort of parallel with the theology underlying the rite of the Tigillum Sororium. Crane is a nymph of the sacred wood of Helernus, located at the issue of the Tiber, whose festival of February 1 corresponded with that of Juno Sospita: Crane might be seen as a minor imago of the goddess. Her habit of deceiving her male pursuers by hiding in crags in the soil reveals her association not only with vegetation but also with rocks, caverns, and underpassages. Her nature looks to be also associated with vegetation and nurture: G. Dumezil has proved that Helernus was a god of vegetation, vegetative lushiousness and orchards, particularly associated with vetch. As Ovid writes in his Fasti, June 1 was the festival day of Carna, besides being the kalendary festival of the month of Juno and the festival of Juno Moneta. Ovid seems to purposefully conflate and identify Carna with Cardea in the aetiologic myth related above. Consequently the association of both Janus and god Helernus with Carna-Crane is highlighted in this myth: it was customary on that day eating vetch and lard, which were supposed to strengthen the body. Cardea had also magic powers for protecting doorways (by touching thresholds and posts with wet hawthorn twigs) and newborn children by the aggression of the striges (in the myth the young Proca). M. Renard sees the association of Janus with Crane as reminiscent of widespread rites of lustration and fertility performed through the ritual walking under low crags or holes in the soil or natural hollows in trees, which in turn are reflected in the lustrative rite of the Tigillum Sororium. Macrobius relates Janus was supposed to have shared a kingdom with Camese in Latium, on a place then named Camesene. He states that Hyginus recorded the tale on the authority of a Protarchus of Tralles. In Macrobius Camese is a male: after Camese's death Janus reigned alone. However Greek authors make of Camese Janus's sister and spouse: Atheneus citing a certain Drakon of Corcyra writes that Janus fathered with his sister Camese a son named Aithex and a daughter named Olistene. Servius Danielis states Tiber (i. e. Tiberinus) was their son. Arnobius writes that Fontus was the son of Janus and Juturna. The name itself proves that this is a secondary form of Fons modelled on Janus, denouncing the late character of this myth: it was probably conceived because of the proximity of the festivals of Juturna (January 11) and the Agonium of Janus (January 9) as well as for the presence of an altar of Fons near the Janiculum and the closeness of the notions of spring and of beginning. Plutarch writes that according to some Janus was a Greek from Perrhebia. When Romulus and his men kidnapped the Sabine women, Janus caused a volcanic hot spring to erupt, resulting in the would-be attackers being buried alive in the deathly hot, brutal water and ash mixture of the rushing hot volcanic springs that killed, burned, or disfigured many of Tatius's men. This spring is called Lautolae by Varro. Later on, however, the Sabines and Romans agreed on creating a new community together. In honor of this, the doors of a walled roofless structure called 'The Janus' (not a temple) were kept open during war after a symbolic contingent of soldiers had marched through it. The doors were closed in ceremony when peace was concluded. In accord with his fundamental character of being the Beginner Janus was considered by Romans the first king of Latium, sometimes along with Camese. He would have received hospitably god Saturn, who, expelled from Heaven by Jupiter, arrived on a ship to the Janiculum. Janus would have also effected the miracle of turning the waters of the spring at the foot of the Viminal from cold to scorching hot in order to fend off the assault of the Sabines of king Titus Tatius, come to avenge the kidnapping of their daughters by the Romans. His temple named Janus Geminus had to stand open in times of war. It was said to have been built by king Numa Pompilius, who kept it always shut during his reign as there were no wars. After him it was closed very few times, one after the end of the first Punic War, three times under Augustus and once by Nero. It is recorded that emperor Gordianus III opened the Janus Geminus. It is a noteworthy curiosity that the opening of the Janus was perhaps the last act connected to the ancient religion in Rome: Procopius writes that in 536 CE, during the Gothic War, while general Belisarius was under siege in Rome, at night somebody opened the Janus Geminus stealthily, which had long stayed closed since 390, year on which Theodosius I's edict banned the ancient cults. Janus was faithful to his liminal role also in the marking of this last act. The uniqueness of Janus in Latium has suggested to L. Adams Holland and J. Gag� the hypothesis of a cult brought from far away by sailors and strictly linked to the amphibious life of the primitive communities living on the banks of the Tiber. In the myth of Janus the ship of Saturn as well as the myth of Carmenta and Evander are remininscent of an ancient Preroman sailing life. The elements that connect Janus to sailing are summarized here below as presented in the work of Gage. 1. The boat of Janus and the beliefs of the primitive sailing techniques. a) The proximity of Janus and Portunus and the functions of the flamen Portunalis. The temple of Janus was dedicated by C. Duilius on August 17, day of the Portunalia. The key was the symbol of both gods and was also meant to signify that the boarding boat was a peaceful merchant boat. The flamen Portunalis oiled the arms of Quirinus with an ointment kept in a peculiar container named persillum, term perhaps derived from Etruscan persie. A similar object seems to be represented in a fresco picture of the Calendar of Ostia on which young boys prepare to apply a resin contained in a basin to a boat standing on a cart, i.e. yet to be launched. 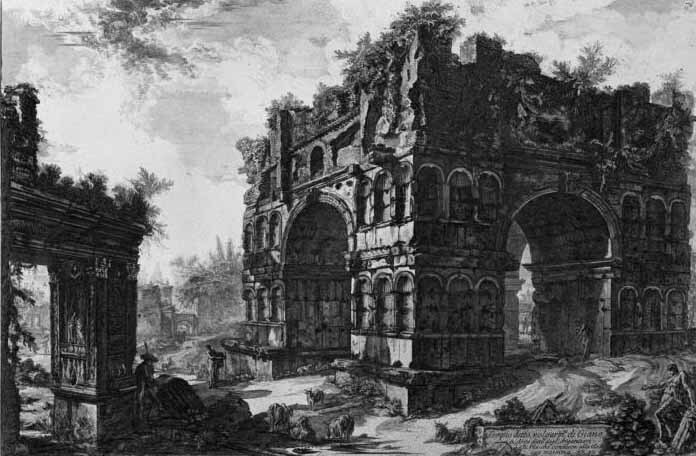 b) The Tigillum Sororium would be related to a cult of wood of the Horatii, as shown by the episodes of the pons sublicius defended by Horatius Cocles and of the posts of the main entrance of the temple of Jupiter Capitolinus, on which Marcus Horatius Pulvillus lay his hand during the dedication rite. Gag� thinks the magic power of the Tigillum Sororium should be due to the living and burgeoning nature of wood. 2. Falacer and flamen Falacer as related to a sacred tree useful in shipbuilding. This flamen would be related to Janus as the flamen Portunalis is because of the association of pater Falacer and shipping. a) The name of divus pater Falacer would be that of a Sabine god similar to Quirinus, i.e. a spear god from the town of Falacrinae. The term is related to falarica, a javelin soaked in pitch, ending with a point of inflammable material. Falas in Etruscan means pole or tower. The name could be related to that of the faba graeca the Greek lotus, imported from Syria (Celtis australis). This tree would have been used among certain communities as the wild olive was to make rolls in order to haul ships upon. The name of the flamen would reflect an ancient name of this tree later corrupted into faba. b) Religious quality of trees as the wild olive (analogous to that of corniolum and wild fig) to sailing communities: it does not rot in sea water, thence it was used in shipbuilding and the making of rolls for the hauling of ships overland. 3. Janus and the depiction of Boreas as Bifrons: climatological elements. a) The calendar of Numa and the role of Janus. Contradictions of the ancient Roman calendar on the beginning of the new year: originally March was the first month and February the last one. January, the month of Janus, became the first afterwards and through several manipulations. The liminal character of Janus is though present in the association to the Saturnalia of December, reflecting the strict relationship between the two gods and the rather blurred distinction of their stories and symbols. The initial role of Janus in the political-religious operations of January: nuncupatio votorum spanning the year, imperial symbol of the boat in the rite of opening of the sailing season of the vota felicia. Janus and his myths allow for an ancient interpretation of the vota felicia different from the Isiadic one. b) The idea of the Seasons in the ancient traditions of the Ionian Islands. The crossing of the Hyperborean myths. Cephalonia as a place at the cross of famous winds. Application of the theory of winds for the navigation in the Ionian Sea. The type Boreas Bifrons as probable model of the Roman Janus. The observation has been made first by the Roscher Lexicon: "Ianus is he too, doubtlessly, a god of wind" and repeated in the RE Pauly-Wissowa s.v. Boreas by Rapp. P. Grimal has taken up this interpretation connecting it to a vase with red figures representing Boreas pursuing the nymph Oreithyia: Boreas is depicted as a two headed winged demon, the two faces with beards, one black and the other fair, perhaps symbolizing the double movement of the winds Boreas and Antiboreas. This proves the Greek of the V century BC did know the image of Janus. Gage feels compelled to mention here another parallel with Janus to be found in the figure of Argos with one hundred eyes and in his association with his murderer Hermes. Among the winds studied by Greek sailors one can number Auster and Aquilon. Favonius on the other hand is not known to the Greek but is of particular relevance to the Roman as it started to blow exactly on the sixth day before the Idi of February: it was regarded as the bringer of the Springtime renewal of life. Few days later recurred the festival of Faunus, on the idi. c) Solar, solsticial and cosmological elements. While there is no direct proof of an original solar meaning of Janus, this being the issue of learned speculations of the Roman erudits initiated into the mysteries and of emperors as Domitian, the derivation from a Syrian cosmogonic deity proposed by P. Grimal looks more acceptable. Gage though sees an ancient, preclassical Greek mythic substratum to which belong Deucalion and Pyrrha and the Hyperborean origins of the Delphic cult of Apollo as well as the Argonauts. The beliefs in the magic power of trees is reflected in the use of the olive wood, as for the rolls of the ship Argo: the myth of the Argonauts has links with Corcyra, remembered by Ampelius. 4. The sites of the cults of Janus at Rome and his associations in ancient Latium. a) Argiletum. Varro gives either the myth of the killing of Argos as an etymology of the word Argi-letum (death of Argos), which is not reliable, or the place standing upon a soil of clay, argilla. However the names in -etum are usually referred to trees. The place so named stood at the foot of the Viminal, the hill of the reeds. It could also be referred to the white willow tree, used to make objects of trelliswork. The word could also be linked to the Argei the 27 or 30 dolls thrown into the Tiber in the rite of May 15. On them the more accepted opinion (at the time, 1979) is that they represented Greeks, Argei being their ancient designation by the Romans. The rite could be a substitution rite for human sacrifices or be original as such. The most supported opinion among the Ancient was that of a rite of substitution of human sacrifices to Saturn ascribed to Hercules. At any rate the rite must be associated to a local Preroman life linked to the Tiber, to a river religion in which the reeds harvested in the river itself or its banks had a peculiar value. Janus though is not present in this rite. b) The Janiculum may have been inhabited by people who were not Latin but had close alliances with Rome.The right bank of the Tiber would constitute a typical, commodious landing place for boats and the cult of Janus would have been double as far as amphibious. c) Janus's cultic alliances and relations in Latium show a Prelatin character. Janus has no association in cult (calendar or prayer formulae) with any other entity. Even though he has the epithet of Pater he is no head of a divine family; however some testimonies lend him a companion, sometimes female and a son and/or a daughter. They belong to the family of the nymphs or genies of springs. Janus intervenes in the miracle of the hot spring during the battle between Romulus and Tatius: Juturna and the nymphs of the springs are clearly related to Janus as well as Venus, that in the Ovid's Metamorphoses cooperates in the miracle and that may have been confused with Venilia, or perhaps the two were originally one. Janus has a direct link only to Venilia with whom he fathered Canens. The magic role of the wild olive tree (oleaster) is prominent in the description of the duel between Aeneas and Turnus reflecting its religious significance and powers: it was sacred to sailors, also to those who had shipwrecked as a protecting guide to the shore. It was probably venerated by a Prelatin culture in association with Faunus. In the story of Venulus coming back from Apulia too we see the religious connotation of the wild olive: the king discovers one into which a local shepherd had been had been turned for failing to respect some nymphs he had come across in a nearby cavern, apparently Venilia, as she was the deity associated with the magic virtues of such tree. Gag� finds it remarkable that the characters related to Janus are in the Aeneis on the side of the Rutuli. In the Aeneis Janus would be represented by Tiberinus. Olistene, the daughter of Janus with Camese, may reflect in her name that of the olive or oleaster, or of Oreithyia.Camese may be reflected in Carmenta: Evander's mother is from Arcadia, comes to Latium as an exile migrant and has her two festivals in January: Camese's name does not look Latin. a) The vagueness of Janus's association with the cults of primitive Latium and his indifference towards social composition of the Roman State suggest the inference that he was a god of an earlier amphibious merchant society in which the role of the guardian was indispensable. b) Janus bifrons and the Penates. Even though the cult of Janus cannot be confused with that of the Penates, related with Dardanian migrants from Troy, the binary nature of the Penates and of Janus postulates a correspondent ethnic or social organisation. Here the model is thought to be provided by the cult of the Magni Dei or Cabeiri preserved at Samothrace and worshipped particularly among sailing merchants. The aetiological myth is noteworthy too: at the beginning one finds Dardanos and his brother Iasios appearing as auxiliary figures in a Phrygian cult to a Great Mother. In Italy there is a trace of a conflict between worshippers of the Argive Hera (Diomedes and the Diomedians of the south) and of the Penates. The cult of Janus looks to be related to social groups remained at the fringe of the Phrygian ones. They might or might not have been related to the cult of the Dioscuri. c) The ianitrices in Roman law. The term is attested by Modestinus in the Digesta 38, 10, 4, 6 and glossed by Isidorus Origines 9, 7, 17. It denotes the spouses of the brothers of one's husband: it is attested only in the imperial period and in the juridical language. It has a symmetric correspondent in levir brother of one's husband. It is possible to suppose that the word ianitrix may at its origin have issued from the cult of Janus, which could have given special functions to women married to the two indivisible companions while later it got fixed to a special sense of relations. This topic bears on the matrimonial practices of early Roman society which show traces of a regimen different from the classic one, i. e. monogamic with exogamy. The relationship between Janus and Juno is defined by the closeness of the notions of beginning and transition and the functions of conception and delivery, result of youth and vital force. The reader is referred to the above sections Cultual epithets and Tigillum Sororium of this article and the corresponding section of article Juno. Quirinus is a god that incarnates the quirites, i.e. the Romans in their civil capacity of producers and fathers. He is surnamed Mars tranquillus peaceful Mars, Mars qui praeest paci Mars who presides on peace. His function of custos guardian is highlighted by the location of his temple inside the pomerium but not far from the gate of Porta Collina or Quirinalis, near the shrines of Sancus and Salus. As a protector of peace he is nevertheless armed, in the same way as the quirites are, as they are potentially milites soldiers: his staue represents him is holding a spear. For this reason Janus, god of gates, is concerned with his function of protector of the civil community. For the same reason the flamen Portunalis oiled the arms of Quirinus, implying that they were to be kept in good order and ready even though they were not to be used immediately. Dumezil and Schilling remark that as a god of the third function Quirinus is peaceful and represents the ideal of the pax romana i. e. a peace resting on victory. Portunus may be defined as a sort of duplication inside the scope of the powers and attributes of Janus. His original definition shows he was the god of gates and doors and of harbours. In fact it is debated whether his original function was only that of god of gates and the function of god of harbours was a later addition: Paul the Deacon writes: "... he is depicted holding a key in his hand and was thought to be the god of gates". Varro would have stated that he was the god of harbours and patron of gates. His festival day named Portunalia fell on August 17, and he was venerated on that day in a temple ad pontem Aemilium and ad pontem Sublicium that had been dedicated on that date. Portunus, unlike Janus, had his own flamen, named Portunalis. It is noteworthy that the temple of Janus in the Forum Holitorium had been consecrated on the day of the Portunalia and that the flamen Portunalis was in charge of oiling the arms of the statue of Quirinus. The relationship between Janus and Vesta touches on the question of the nature and function of the gods of beginning and ending in Indo-European religion. While Janus has the first place Vesta has the last, both in theology and in ritual (Ianus primus, Vesta extrema). The last place implies a direct connexion with the situation of the worshipper, in space and in time. Vesta is thence the goddess of the hearth of homes as well as of the city. Her inextinguishable fire is a means for men (as individuals and as a community) to keep in touch with the realm of gods. Thus there is a reciprocal link between the god of beginnings and unending motion, who bestows life to the beings of this world (Cerus Manus) as well as presiding over its end, and the goddess of the hearth of man, which symbolises through fire the presence of life. Vesta is a virgin goddess but at the same time she is considered the mother of Rome: she is thought to be indispensable to the existence and survival of the community. The god with two faces appeared repeatedly in Babylonian art. Reproductions of the image of such a god, named Usmu, on cylinders in Sumero-Accadic art. On plate XXI, c, Usmu is seen while introducing worshippers to a seated god. Janus-like heads of gods related to Hermes have been found in Greece, perhaps suggesting a compound god.